Austria's first Grand Prix took place in 1971 at the Salzburgring circuit, which hosted Grand Prix racing on a total of 22 occasions, until 1994. Whosoever saw the last week’s Czech GP must be waiting for the 2017 Austrian GP eagerly because of the obvious reasons. The current MotoGP World Championship Mark Marquez won a brilliant race at the Brno circuit, giving him a 14 points advantage over the nearest rider. The MotoGP returned to Austria in 2016 after a break of 18 years, with the country hosting a motorcycle Grand Prix event at the Red Bull Ring in Spielberg - the last time being in 1997. Yamaha trialed the newly sculpted fairing, designed to improve corner exit speed by keeping the front wheel on the ground under acceleration in the manner of the now-banned winglets, with both test pacesetter Rossi and team-mate Maverick Vinales. While Rossi says the fairing made the bike easier to ride, he will not use it for this weekend's Red Bull Ring race because it compromises top speed and the Austrian track features long straights. Looking to defend his position as much as possible is Marquez. Now with the most breathing space of anyone, the rider from Cervera has a 14 point cushion as the paddock arrives at a venue that was more difficult for him last year. Using the post-Czech GP test to prepare for Austria, however, leaves the number 93 more confident of putting up a bigger fight this year. Brno winner Marc Marquez said Honda had also worked on ideas for the Red Bull Ring. 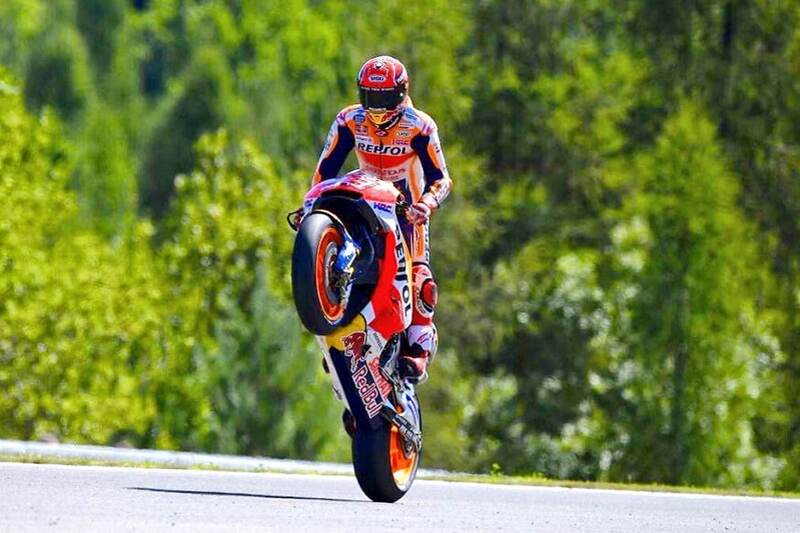 Marquez believes that wheelie should be avoided in the Austrian track. Teammate Dani Pedrosa, who gained on everyone except Marquez by coming second in Brno, will be a key rival, too – with both men firmly pitched against each other as well as the rest of the field. 150 podiums into his career, Pedrosa remains a threat. The Pramac team fielded the first Independent Team rider in 2016: Scott Redding, and their Ducati machinery will be a threat again. Redding is now on the bike that won last year, and teammate Danilo Petrucci on the GP17 along with Dovizioso and Lorenzo. Having just missed out on victories this season and having often made his name at the front, Petrucci will see a big opportunity at the Red Bull Ring to kickstart the second half of his campaign. Alvaro Bautista (Pull&Bear Aspar Team) and teammate Karel Abraham also have Borgo Panigale machinery, as well as Reale Avintia Racing’s Hector Barbera and Loris Baz.